Richard Pinhas - "Event And Repetitions"
Some point to his groundbreaking work with guitars and analog synthesizers, yet others dismiss his work with a disparaging description as "the French Fripp". This writer is in the "camp of the awed", completely taken with his work. Pinhas is a musical innovator, whose works speak directly to the questions of how to integrate Electronic Music with the energy and rhythmic nature of "Rock" music. I have made a detailed examination of Pinhas work in a number of previous editions of Aural Innovations, so publisher Jerry K had no choice but to forward me a review copy of RP's latest release, and I'll spend a few words in praising it! 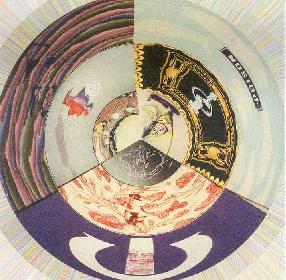 Most of this was recorded at home, from RP's Guitars and GuitarSynth direct to computer, and is somewhat similar to his 1995 release ("L'Un et Multiples", and the more recent works with French SF writer Maurice Dantec. On this one, he doesn't have to worry about making room for the voice, thus allowing his skills as an improviser to shine through, as Guitar textures bristle and curl from the speakers, creating a completely Alien environment of sound. His use of sustain allows him to utilize legato melodic figures, and exercises great control over his GuitarSynth. There is a shimmering quality to the overall sound being treated and manipulated by his computer, yet it is never cute or quaint, for there is an aggressiveness also inherent in this music, creating a tension which holds the listener's interest in the ebb and flow of the multi-guitars. "EFRIM" is an extended work, in which one can perceive a number of different movements, melodies assert themselves, mutate and progress, then fade or dissolve into other sections. Throughout, there's great attention to the material, each little sound being incorporated into the whole music. That one person can create an entire environment with the most basic of "Rock" instruments shows a highly developed concept the "Electric" nature of the instrument, and the devices triggered or modifying the Guitar signal. "Event and Repetitions" is the fourth Pinhas CD on which the main sound generator is Guitar or GuitarSynthesizer, and all have been extremely successful, yet as a listener/devotee of his work, I'd like to hear the music composed and played by both a full band (i.e. with Rhythm Section), and some of Pinhas' wondrous Analog Synthesizer work (this man is a master of the ARP 2600 and EMS VCS-3 Synthesizers…I understand he has sold his older equipment, but I'd be glad to lend him mine!). Of course, I must praise CUNEIFORM Records, and give special props to label founder Steve Feigenbaum, as everything in the production and presentation of the CD is first class. Steve was key in presenting Pinhas older works, reissuing his 70s/80s recordings at a time those works were in high demand, both as collector's items and references for the burgeoning Techno/Trance community of Improvising Electronic Music Composers. Richard Pinhas will be on tour in the USA this Fall, playing concerts in Washington DC, Philadelphia, Atlanta and Chicago, and I urge everyone interested in Electronic Music, Guitar Sorcery and just great musical presentations to go and check him out, he hasn't disappointed me yet! For the latest schedule of Richard Pinhas' Fall 2002 US tour check out http://www.cuneiformrecords.com/artistnews.html. Check out Doug Walker's DETAILED analysis of Richard Pinhas and Heldon at the following links in Aural Innovations issues #4, #5 and #9.